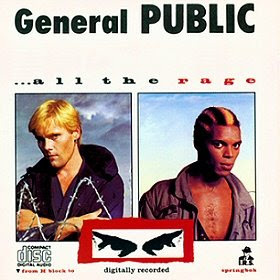 One of the good things that came out of the break up of Ska wonderkids "The English Beat" in 1983 was the formation of "General Public" by two of the former members. Although originally made up of former members of The Clash, The Specials and Dexy's Midnight Runners, in the end it was only Dave Wakeling and Ranking Roger that endured. Their biggest hit was Tenderness off their first album from 1984, "All The Rage". It managed to reach #11 in Canada and #27 in the U.S. Although they managed a few more hits over the years, including songs on some well known 80s movies like Weird Science and Ferris Bueller's Day Off, they never matched the same success. Dave still tours as the English Beat and plays General Public tracks but ol' Roger called it quits for good.